The Addie Joss monument at Watertown’s Washington Park. 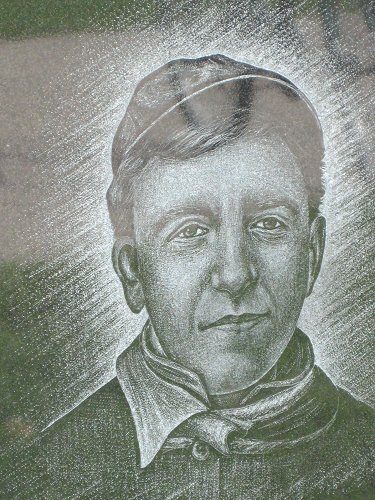 Portrait of Addie Joss etched on monument at Washington Park. 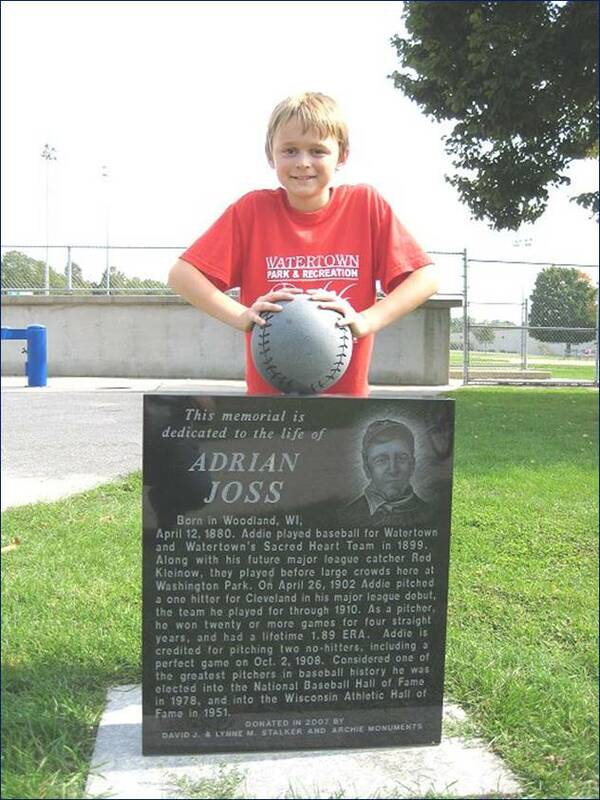 Young ball player who knows all about Adrian Joss, thanks to the monument erected. Born in Woodland, WI, April 12, 1880. Addie played baseball for Watertown and Watertown’s Sacred Heart Team in 1899. Along with his future major league catcher Red Kleinow, they played before large crowds here at Washington Park. On April 26, 1902 Addie pitched a one hitter for Cleveland in his major league debut, the team he played for through 1910. As a pitcher, he won twenty or more games for four straight years, and had a lifetime 1.89 ERA. Addie is credited for pitching two no-hitters, including a perfect game on Oct. 2, 1908. Considered one of the greatest pitchers in baseball history he was elected into the National Baseball Hall of fame in 1978, and into the Wisconsin Athletic Hall of Fame in 1951.
to ever call Watertown his team. Adrian Joss, of Juneau, who pitched for the Sacred Hearts and the Watertown last summer, has received an offer to play with Toledo in the Interstate league the coming season. A contract has been executed on the part of the Toledo club by Manager Stroebel and forwarded to Joss, but the young twirler is on the claim list of the Milwaukee club and cannot therefore join any other team unless Milwaukee relinquishes its rights to him. It is reported that Toledo has offered Joss over $100 per month. "The Watertown Republican is of the opinion that Adrian Joss cannot sign a contract to play with Toledo unless released by the Milwaukee club, which "claims" him. We don't know much about baseball league laws, but it strikes us as strange that a player must go where he is claimed whether he wants to or not; and this too before he has ever signed a contract with any of the league clubs. Joss says that he is going to Toledo." Now, we do not profess to be a baseball oracle, but we have watched affairs of the diamond long enough to venture the prediction that if Joss is really on Milwaukee's "claim" list and if that club really desires his services the coming season, the young twirler will play with the Cream City or else not with any team under the national agreement. Joss' contract with Toledo is not worth the paper it is written on unless Milwaukee consents to the transaction. So much for baseball regulations. Toledo, Ohio, April 14.—Addie C. Joss is dead. 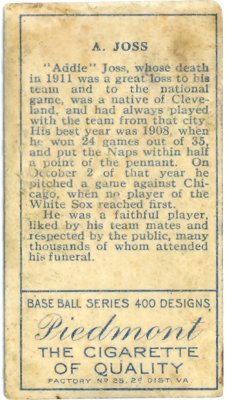 The star pitcher of the Naps breathed his last at 1:30 o'clock this morning at his home in this city, where he had been ill and confined to his bed for several weeks. Not until the last did the doctors give up hope, for they were uncertain as to just what ailed Joss. There were symptoms of several brain disorders, according to Dr. George L. Chapman, a local physician, and Dr. H. M. Castle, physician of the Cleveland team, who was sent here yesterday to consult with Dr. Chapman. After death it was determined that Joss died of tuberculosis of the brain. The great pitcher was taken ill at Chattanooga while on the southern training trip with his team. He suddenly tumbled over as in a faint while on the diamond, and had to be carried to the club house. When he revived he complained of a severe headache, and these continuing, he was sent to his home here. He grew worse, the headache continued and he had spells of unconsciousness. Then he sank into a semiconscious state and could be aroused only by hard shaking, but he never fully realized his surroundings. He would lie in a deep stupor for days. Joes' greatest work as a pitcher was done with a game with the White Sox in 1908, when he was pitted against Ed Walsh. He pitched a no-hit no-run game, and never a White Sox warrior reached first base. 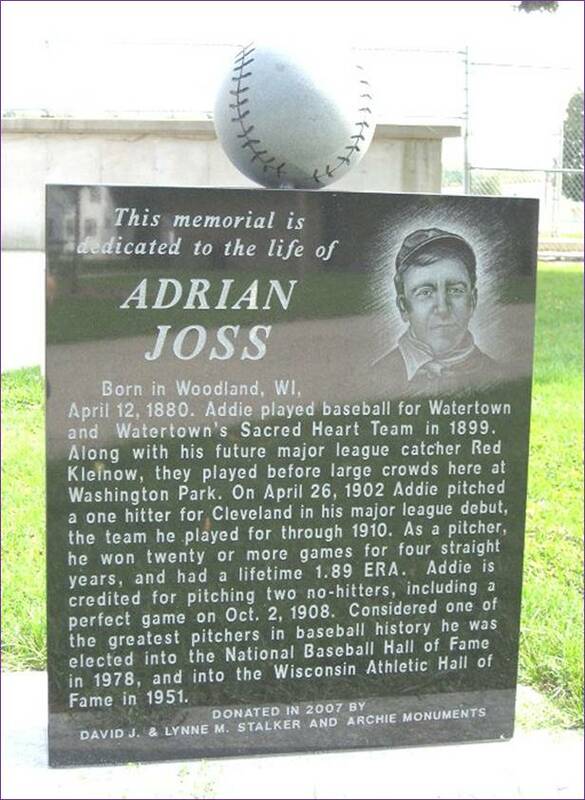 Toledo, O., April 15.—Adrian C. Joss, better known In the baseball world as "Addle," well-known pitcher of the Cleveland American baseball team, died at his home here. Death was due to tubercular meningitis, from which he had been a sufferer since last Sunday. Joss was thirty-one years old. He is survived by a wife and two children. He was a thirty-second degree Mason and a member of the Mystic Shrine. 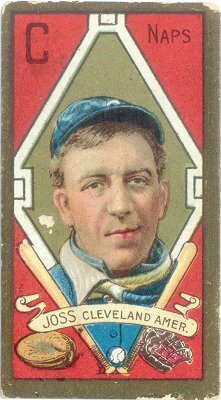 Joss joined the Cleveland American league club in 1903. He became one of the premier pitchers of the country and had the honor of pitching a no-hit, no-run game against the Chicago White Sox in 1908, his opponent being Ed. Walsh. Toledo, Ohio.. April 17 — One of the greatest assemblages of Free Masons and baseball players that ever paid tribute to a departed brother undoubtedly assembled at the funeral of Addie Joss in the Masonic Temple here this afternoon at 2 o'clock. The funeral sermon was preached by the Rev. W. A. Sunday, now conducting a revival campaign in the city, assisted by the Rev. R. D. Hollington, D. D., pastor of St. Paul’s Methodist Church. The funeral services were held under the auspice of the Masonic orders, Ancient and Accepted Scottish Rite, Zalley of Toledo commandery Knights Templar. JUNEAU — The unveiling of the Addie Joss Historical Marker will highlight the Dodge County Sesquicentennial and Addie Joss Days Celebration to be held June 27 and 28 in Juneau. The historical tribute to the 150th anniversary of the county and to a legendary hero, Adrian Joss, will be filled with several activities, including an antique and collector car show, water barrel fights, horseshoe pitching tournament, bingo, women’s softball tourney, men’s baseball tourney, ice cream social, community picnic, mini-track meet, barbershop music concert, a dance under the stars and fireworks. About a dozen retired major league baseball players will be in attendance to pay tribute to Joss who was one of just four Wisconsin residents to be enshrined in the Baseball Hall of Fame. Joss played for the Cleveland Naps from 1902-1910 and was one of a handful of pitchers to ever throw a perfect game. Before his untimely death from tubercular meningitis, Joss collected 160 career victories including 45 shutouts, two no-hitters and three one-hitters.